REMICADE infusions or chemotherapy is for patients that live with rheumatoid arthritis, ulcerative colitis, plaque psoriasis, ankylosing spondylitis and Crohn's disease. Patients can endure mild to severe side effects. REMICADE is given by IV infusion, a simple process that usually takes about two hours. A healthcare professional administers the treatment in a supervised environment, which is either a physician's office or a treatment center. You will receive your first dose followed by additional doses at two and six weeks after the first dose. You will then receive a dose every eight weeks. If you have ankylosing spondylitis, you will receive treatment every six weeks. 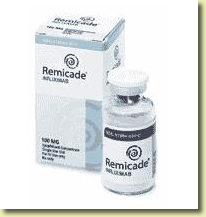 With REMICADE, all you have to do is come for your appointment. Your physician will carefully calculate the dosage customized to your weight so that you get the best response to the treatment. Individual results may vary. Preparation: Prior to your infusion, your blood pressure, pulse, and temperature will be monitored. Relax: Your physician and nurse will closely monitor your progress during your infusion treatment. During this time, you can relax, read a book, catch up on some work, watch TV or a movie, or listen to music.